My mother, Laleh Bakhtiar in Tehran, Iran. In 1976, she authored Sufi Expressions of the Mystic Quest published by Thames and Hudson. Ahead of my mother, Laleh Bakhtiar’s 80th birthday, I’m sharing some of her journey, in a series of posts, in her own words. A renowned scholar of Islam, she was awarded a Lifetime Achievement Award from the Mohammed Webb Foundation in Chicago in May 2016, for her contributions to the American Muslim Community. 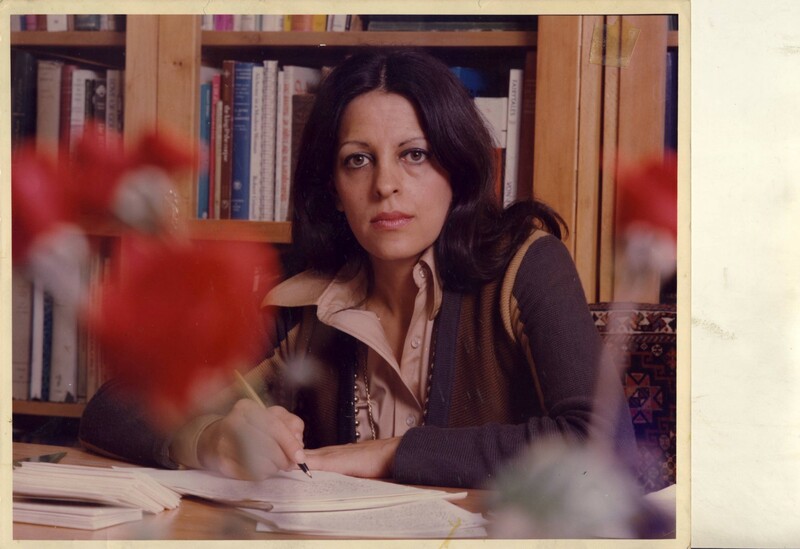 The following stories offer a glimpse of her life — one that has been rich and fulfilling as a scholar, a mentor, a mother, a grandmother and a global citizen in between America and Iran. You can read the first post here. We pick up her story in Pittsburgh, Pennsylvania in 1958. A small women’s liberal arts college, Chatham College (now Chatham University) in Pittsburgh, offered me an academic scholarship. After finishing Holton Arms, I would have preferred going to Radcliffe to be near my intellectual brother Cyrus who was at Harvard, but my mother Helen’s finances were tight. So I went to Chatham and joined a club that held discussions on religion. I was very active and even became the token Muslim representative at religious conferences. I had never known anyone who practiced it, yet it gave me a great sense of identity to be part of it. It was at one of the Friday night dances that I met someone from Carnegie Mellon, the college down the road from Chatham. This someone had a fraternity brother who he called “an Arab.” This sounded rather fascinating since my Middle Eastern background was Persian and not Arab, but I was willing to go along with meeting him. The friend fixed us up on a blind date. It was love at first sight for both of us. He had grown up in America with his Persian parents and was studying architecture. I realized even before we met that his name, Nader, was Persian. We were married on June 6, 1960 at the home of Mr. Nemazee in Potomac Maryland. Mr. Nemazee was a wealthy businessman and dear friend to Helen. Another friend of Helen was Supreme Court Justice William O Douglas who was a witness at our wedding ceremony. It was the first and last time that all seven of Helen’s children were together with Helen. After our wedding, undecided on my area of study, I was determined to study whatever interested Nader! Any and everything seemed possible. I settled for a BA in history and then went on to law school at the University of Pittsburgh thinking that as a lawyer I would be able to support him when it came to contracts and legal matters. Harvard University accepted my husband for the MA program, so I followed him, enrolling at Boston University to continue law school. Chubby Checkers and the twist had become the rage by the time of our first Thanksgiving in Cambridge. My All-American brother, Jamshid, who was by then in medical school at UVA, came and joined sixteen of our friends for four days of twisting. The Monday morning after the Thanksgiving vacation, I had severe pain in my right side. I had appendicitis and had to be operated on. It was as a result of this operation that I learned I had endometriosis and that if I did not have children soon I might never be able to have any. Meanwhile, I had to leave law school as I had missed six weeks of the semester. I applied to Harvard to study City Planning, thinking that this was to be my career. I was accepted and just about to begin the winter semester when I realized I was pregnant. As students, we could not afford both the doctor’s fee and my tuition, so I turned my attention to motherhood. Nader’s MA in Architecture program at Harvard was then a one year course. When he finished, we moved to San Francisco where he got a wonderful job with Skidmore, Owings, and Merrill. While we loved the Bay area, had two beautiful daughters Mani and Iran, and were active in the peace movement, somehow by our mid-twenties, we realized that we may look Persian, but we barely knew where Iran was on the map. We were always presented as Muslim and yet we had no real idea what that meant in 1964 San Francisco. We felt challenged to find out so when my husband was offered a job with the Iranian Oil Company, we moved from San Francisco with our two San Francisco-born daughters, Mani and Iran, to a small town in the south of Iran called Masjed-e Sulayman (the Mosque of Solomon). We so immersed ourselves in ancient Persian culture that we forgot to notice the difference in climate! Spending two years in this desolate area, we were the main welcoming committee for whoever came there. One of the people we met was the famous French archeologist Roman Ghirshman. We spent our weekends at his digs, Mani, Iran and I picnicking on ruins thousands of years old, while my husband worked with him on the drawings. Going to the ruins, watching the dig and the uncovering of thousands of years of history, we felt as though we had really come home. At last, we could identify with the culture. It seemed as if we had found a great treasure. The treasure had always been there yet we had been unaware of it. Two years later, we moved to Tehran. I soon learned that there were classes taught in English (I still had not learned Persian) on Persian Culture and Sufism by Islamic philosopher Seyyed Hossein Nasr. One of my brothers had been at Harvard with him and I had met him in Cambridge on one or two occasions. Now, the thought that I could take courses with him at Tehran University excited me. I enrolled in the fall of 1966, just after we arrived in Tehran. I began to experience the great hidden treasures of Persian culture and civilization along with the mystical dimension of Islam, Sufism. I also had a tutor and studied everyday for three years. Through Sufism, I became a pilgrim in search for thirst. The thirst of the beloved, knowledge, and sense of place and my identity as an American and Iranian woman. Growing up in America, I found a well of knowledge and for many years it quenched my thirst with a clear, cool, loving, pure water which brought conception and creativity. And then, little by little, it began to spread itself onto the desert, the endless, immense expanse of earth and it dried up. Now in my early 30’s, I drank from the water of love, and God was gracious, kind, generous, forgiving, my Support, my Refuge, my Love, my Heart, my Mind, my Soul. He protected and guided me and led me towards His path. In 1975, I wrote Sufi Expressions of the Mystic Quest. It was published by Thames and Hudson in 1976. The basis of Sufism, as of all Islam, lies in the two doctrines of the Unity of Being (“There is no god but God”) and the Universal Prototype (“Muhammad is the Messenger of God”). Through the Sufi themes of the descending arc of Creation, the formation of the human soul, and its return through the ascending arc of the Quest, the book brought to light the spiritual reality that underlies the forms and rhythms of the Islamic tradition. To a Sufi, both the ritual of the worshipper and the work of the craftsman evoke the life that resides within all things; the preparedness of matter to answer the call of God. As I lost myself in search of faith and identity, my marriage suffered. Nader and I were married for 16 very happy and fulfilling years and had 3 beautiful children, Mani, Iran and Karim. We were divorced in 1977 just before the cataclysmic Iranian revolution and just after I lost my beloved brother Cyrus in a boating accident. Once again, I sought the wells but they were too shallow to quench my thirst and then I determined to seek thirst and to live in anticipation, to live in expectation, to live in awe and in service — awaiting the Promise of God. Tune in all week for more stories, as we celebrate Laleh, a loving mother and grandmother and pioneering champion of human rights and women’s rights in Islam.